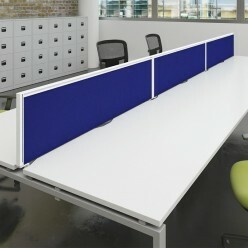 High quality durable desk mounted fabric screen with aluminium frame. Our fabric system desk screen is a fully framed, anodised aluminium extrusion, with a fabric centre panel. With a choice of more than 50 colour, frame and width combinations, there are options to suit every desk.